Brown Mint Leaf Beetle - Chrysolina staphylaea. I think I have the ID right, but would welcome confirmation! 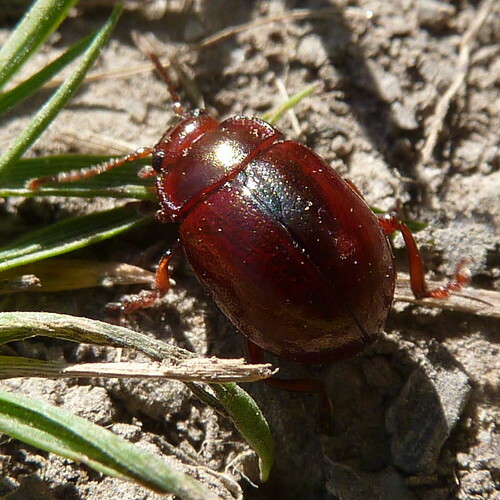 Wide flattened border to sides of pronotum and smaller punctures than C. b£anksii (£ inserted in name to avoid search engines pulling up this picture for the wrong species). Red antennae rule out quite a lot of superficially similar species. Seen crossing a bridleway by a hedgerow and rough grass (chalk), Whiteshute Ridge, Winchester, Hampshire, UK, 6th May 2013.